Despite the SEC making it clear that MLM cryptocurrency opportunities are not exempt from securities regulation, some companies don’t appear to have gotten the memo. One of those companies is Wealth Generators, who are currently gearing up to launch their “Crypto” mining contracts. Randy Schrum is a Wealth Generators affiliate who markets the opportunity through his “Occupy Wealth” branding. [7:50] We are Occupy Wealth. We are what we call “a movement”. We break down the barriers for financial wealth. I’m the founder. 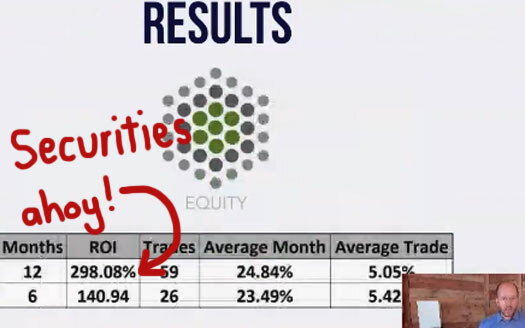 I’ve got to tell you now, I’ve been on this journey for the last several years and one of the things I’ve always looked at is, “How can I teach and share the wealth building strategies that I’ve discovered over the years and bring the best in class of people that can seamlessly open their laptops from anywhere in the world … and can produce wealth”. They can produce passive income. 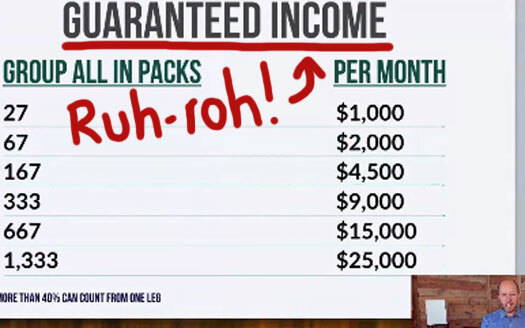 Not just any type of income, but passive – meaning money that comes in whether they’re working or not. That last sentence is key, because it pretty much defines Wealth Generators’ new Crypto mining contracts. Crypto uses a proprietary algorithm to determine the most profitable cryptocurrencies to mine at any given time. Crypto’s algorithm diversifies what is being mined to reduce some of the risk associated with mining cryptocurrency. The cryptrocurrencies that are currently being mined through the Crypto platform are ethereum, dash, monero and ethereum classic, but others may be added at any time. Wealth Generators affiliates buy in for $149.99 and then $500 to $4999.99 per mining contract (another $99.99 is charged per mining contract invested in). [15:36] It’s a minimum deposit of five hundred dollars. It’s 100% automated. Once you get it set up, you don’t have to touch it. Mining contracts pay out for 1200 days, with Schrum claiming Generator tier contracts pay out “about $1 to $2 a day”. Executive contracts purportedly pay $6 to $8 a day and Premiere “anywhere from $12 to $24”. Additional mining rigs can be obtained via a two level deep referral system, based on “crypto points”. [8:38] As the founder and as the leader of this community, what we do is we risk, I risk my own money verifying what works. I go out there and do the due-diligence. I go out there and do the research. And one of the deals … (cuts out) … to you is a publicly traded company that has been in business for three years. A+ rated by the Better Business Bureau and most of all, they are publishing their results. So you’re not going to see a company out there in this space that’s doing those three things. And so you can see it, you can see it physically firsthand – what’s going on. Yet despite these assurances, Schrum doesn’t name the company Wealth Generators is offering contracts through. He does however mention they supposedly have rigs in Hong Kong and New Zealand. What Schrum does confirm is that Wealth Generators are only accepting bitcoin for the contracts, and that the daily ROI is paid out in ethereum. As I mentioned earlier, the key take-away from Wealth Generators’ Crypto offering is that it’s clearly a passive investment opportunity. [9:14] I’m going to break that down for you and how you can position yourself in this new digital gold rush. But more importantly, how you can earn free mining contracts, or mining machines, that spit off cash to you and you’re not doing anything. Understand what I just said: I’m going to show you how to earn these mining machines by the efforts of other people – and you continue to get paid the results every single day. Ie. Wealth Generators’ Crypto platform is clearly a securities offering. Seeing as Wealth Generators are a US company based in Utah (Schrum operates out of Missouri), the Crypto mining contracts require registration with the SEC to ensure everything is above-board. This isn’t optional, this is established securities law in the US dating back to 1933. A search of the SEC’s Edgar database however reveals neither Wealth Generators, Randy Schrum or Occupy Wealth are registered to offer securities in the US. Despite this, Schrum claims he’s currently setting organizing Wealth Generators “leaders” in Hong Kong. The company plans to officially launch its Crypto unregistered securities offering in Las Vegas over January 13th and 14th. In addition to Crypto, Wealth Generators’ other offerings also quite clearly constitute securities offerings. With respect to Ryze AI, Schrum claims to have earned a 16% ROI over six months. [11:42] You see I’ve been testing this product now for over the last year. And I say “testing” but (I’ve been) using it. In just a six month period I saw a sixteen percent return on my deposit. Rather than address regulatory non-compliance (pyramid recruitment and unregistered securities), when the topic of “is Wealth Generators’ Crypto a scam” comes up Schrum instead uses the “global elite”, “ultra wealthy” and finance industry as red herrings. [29:02] If you say this looks like a scam and that, guys listen to me, alright? I’m going to bust a sacred cow here. And the sacred cow is this: Listen, banks are known to generate forty to sixty percent of their profits, right, in the global currencies market. Did you just hear me? And whose money are they using to do it? They’re not using their money, they’re using other people’s money (Schrum uses the acronym “OPM”). So listen, if you’re tired and sick and tired of the global elite um, to be making their money off of other people’s money and you wanna be financially free, then remove that sacred cow you’ve been brainwashed on by that industrial age model, and by broke people who can never get out of their mold. Be that as it may (or not, I’m not here to debate the merits of Schrum’s red herrings), raging against “the banks” is not justification for committing securities fraud. Unfortunately those following Schrum appear to be completely ignorant of securities law and/or blinded by greed. [29:52] Okay it’s time to make a change. It’s time to enlarge your tent stakes and make a decision for yourself. While I can’t say I agree with Schrum over most of the presentation, this is something I can echo. To be sure, Wealth Generators affiliates need to decide whether they wish to engage in offering unregistered securities across the US and abroad. As we’ve seen in USI-Tech, this has the potential to open them up to regulatory liability on both a state and federal level. Update 29th December 2017 – Wealth Generators affiliates have been asserting that the company’s Crypto mining contracts are legit because parent company Investview is registered with the SEC (comments #3 and #5 below). I did my own research into the claim and found that Investview do not disclose Crypto revenue (or any affiliate investment revenue for that matter) in their SEC filings. Update 16th February 2018 – Following publication of this review Randy Schrum deleted his “URGENT CRYPTO BRIEFING!” Facebook video. Update 29th June 2018 – On around March 2018 parent company Investview renamed Wealth Generators to Kuvera Global. If WG doesn’t run the rigs, then there’s another level of markup, or they’re like USI… bogus mining. After all, it doesn’t take much to bribe a pool to put your name on their pool. Track where the money went instead. I have emailed the SEC in Utah about this company and awaiting for there reply. Asked them if Wealth Generators are selling securities. Kasey don’t compare WG with the frauds USI. You clearly have no idea what you’re talking about bud (Ozedit: Offtopic derail attempts and abuse removed). Wealth Generators is a wholly owned by Investview Corporation, a publicly traded company that is required to disclose all activity. Crypto leasing product was disclosed to the SEC i can assure you of that. So when individuals like the author speak out of very little knowledge and say things like “non disclosing mining agreements”- it is a LIE because everything is disclosed to the public. You just have to do your research bud…. You’ve earned a D- today. I promise WG is doing the right thing in the eyes of the law. Try again!. The link you tried to paste was abbreviated and thus didn’t work. Thanks for the heads up though, your comment was the foundation I used to do some further research into Investview and Wealth Generators. You probably won’t like what I found. False!! Do your due diligence & don’t be such an amateur with your poor reporting. Wealth Generators is one of the few in the industry actually doing things right in the eyes of the law. Get outta here with your negligence. No one likes a fraud. ^^ You probably want to read the article I just published. I did a check on the listed company today Investview Inc.
Not in a healthy state then. I always found it amusing how people involved in MLMs always scream “fake news” or “do your research” yet they always fail to provide a proper source or any kind of backing to their arguments. Keep up the great work Oz! Wealth Generators operates its business off shore through a bank in a little known place called Vanuatu managed by some unknown outfit in the UK. For the most part every company in this space who is offering what is called Forex currency exchange and now this BS crypto product was hit with huge tariffs and regulations in the US to operate so they all moved their nefarious practices off shore in order to avoid these high operating costs and also to side step the regulators. Never a good start to an MLM if the company needs to hide how it operates and deliberately avoids regulators. When asked who these people are you get stonewalled. This is a perfect lead up to what I am about to share next 🙂 Coincidentally when you verify some of their exchange products they offer in comparison to what WG says it does in revenue, it doesn’t take a brain surgeon to figure out that 90% of the revenue is derived from RECRUITING!!! 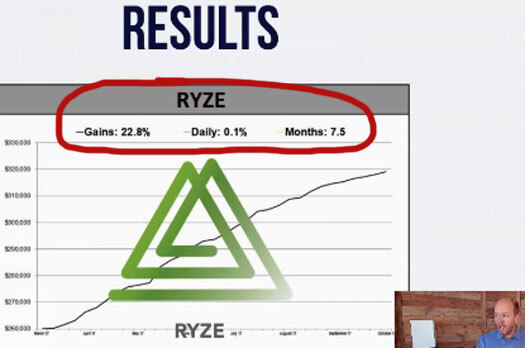 I have watched one of their products known as RYZE, their auto-pilot money maker, for the past year and the numbers don’t add up. Very few are actually buying and or using their products…can you say PYRAMID SCHEME. The MLM industry needs police because scam after scam after scam keeps on popping up ready to pounce on the next unsuspecting sucker that will get scammed from a fast talking slick sales guy with cleverly inserted vernacular like Randy Schrum. I’ve seen his presentations and feel like I need a shower after watching. I wouldn’t buy a tube of toothpaste from this guy. translation…how do I teach people the methodology behind how I scam people so you can go out and scam people as well…too funny ya can’t make this stuff up seriously. Another please avoid MLM if ya know what is good for you. Jason Lee and his wife Emily Lee are the biggest scammers and involved in this. They took $4900 from my dad who is 89 years old on fixed income. That was his savings. BUNCH OF LAZY PYRAMID SCAMMERS. GET A REAL JOB. Randy Schrum just had a confessional speech where he’s admitted that he’ll no longer be marketing the opportunity of mining crypto (perhaps he’s finally realized what he’s been promoting is illegal). I feel bad for the many people who followed him to Las Vegas on several occasions believing he was one of the good guys. (He’s not). He comes across as a nice guy. But he’s very methodical and calculated. Not tow worry though, he’ll sign you up for his new Lifevantage opportunity with his barely tested funnel. Well, I am 0% surprised re Randy Schrum’s ‘confession”. He is a fraud. A user and a fraud. He has led HUNDREDS like a Crypto Pied Piper… right to the edge of financial ruin. All those warnings to others fell on deaf ears and now, peoples futures are a jeopardy. So very glad I never fell for the hype, but I know people who did and invested BORROWED monies in this disaster. Disgusted. Where can you find Randys speech? Same old garbage in a fresh wrapper. Randy Schrum is back in a “Sponsored Ad” on Facebook. Now he’s playing the “Christian” card. Attention Christian Families! I would like to invite you to join our family newsletter on entrepreneurship from a biblical worldview. In this newsletter you’ll gain insights into picking the right business, business planning, marketing, advertising, management, and more. Along what does it look like successfully running a thriving business as a Christian in todays world. You’ll receive a front row seat into our companies and see exactly how our family navigates faith, the great commission, and business. This free subscription includes periodic emails, videos, trainings, and live streams. Noticing that the SEC and state of Texas is cracking down on many of the crypto sellers for false promises and selling securities without a license.